Rejoicing is a decision. We have the choice to wake up in the morning and REJOICE. Some mornings it might 'feel' difficult to rejoice, but you can decide to rejoice anyway! 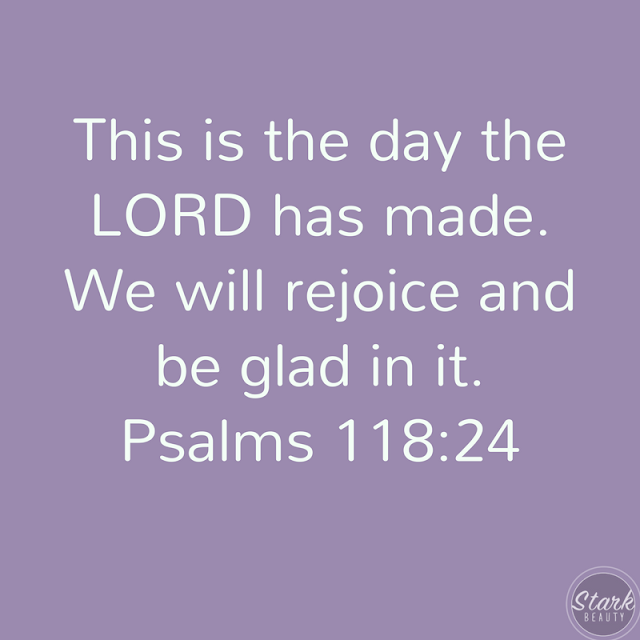 He has great things in store for you today, and you can choose to rejoice and be glad! When you know that God is for you and not against you, it is easier to rejoice. When you know that He loves you immensely, it is easier to rejoice. When you know that His favor surrounds you and that His plan is to prosper you and not to harm you, it is easier to rejoice! Psalms 27:13 says, "I remain confident of this: I will see the goodness of the LORD in the land of the living." Expect to see His goodness in your life today! Walk by faith and not by sight. Maybe it doesn't look like it's going to be a great day, but it doesn't have to 'look' like it's going to be a great day. Walk by faith and know that despite what it might look like, it IS going to be a GREAT day! I keep thinking of Proverbs 3:5, "Trust in the LORD with all of your heart and lean not on YOUR OWN UNDERSTANDING." You might not understand it, but you don't have to! Just trust God and rejoice! He is directing you and leading you. You are in the right place at the right time and this day is BLESSED. Blessings are already lined up for you!